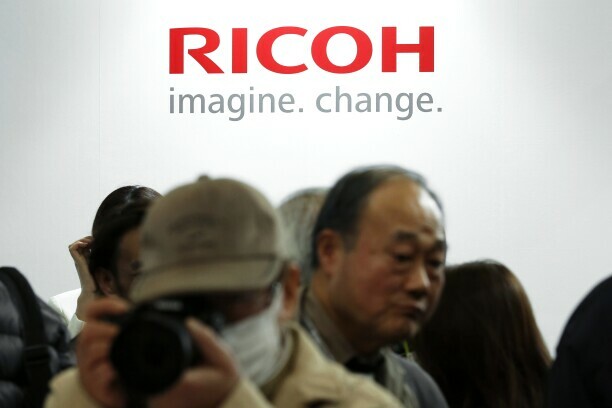 The Ricoh Co. logo is displayed at the CP+ Camera and Photo Imaging Show. Before becoming Ricoh Americas’ general counsel, Jami Segota spent her entire career as outside counsel. In the year since she’s joined the arm of the multinational imaging-and-electronics company focused on U.S., Canada, and Latin America markets, Segota has shifted her focus from risk management to fostering business decisions that protect but don’t shackle innovation. Streamlining processes informs Segota’s ability to be an effective business partner to the larger enterprise. “Legal doesn’t have to be leading the discussion or diving the strategy, but just being a voice, or even an ear, at the table to know what’s coming can go a long way,” Segota said. Here, Segota shares how partnering with departments, such as marketing, sales, and corporate planning, brings greater collaboration to advance company-wide compliance, ethics, and business initiatives. This fall marks your one-year anniversary as Ricoh Americas’ general counsel—what were your top priorities in coming into the role, and how do those efforts stand a year later? I moved into the GC role without any preset priorities, but rather with a vision of making Ricoh’s legal department the best of what a legal department can be in the coming years. That includes providing opportunities for all of our team members to do the kinds of work they find exciting and challenging, while making it easier to work smarter and get things done. So much of the job is [about] matching the right people, process, and task for the best result. I’m also a big nerd for process efficiency. I’ve already undertaken initiatives to streamline, simplify, and automate many areas of our work. But even if Ricoh wasn’t undergoing a continuing transformation right now and was a more static organization, you have to live in the role a bit when becoming a GC. You have to watch and listen, so you can understand where the organization is, where the legal department is, and where both are headed, before you can start implementing initiatives or changes. Developing that picture means not just listening to other leaders across the organization but listening to everyone who does the work of keeping the legal department running. That’s why, when I first took on the GC job, I had one-on-one meetings with every single person in the department—not just my direct reports, not just other team leaders, everyone. I wanted to get their unique and diverse perspectives on fundamental questions, such as “How is the department running? What do we do well? Where can we improve?” The major milestone for my first year has been making the legal department more collaborative, in part because of those one-on-one meetings, and in part because of our process improvement efforts. You replaced a GC with a four-decade tenure. How did you navigate the knowledge transfer process and what were the biggest lessons the outgoing GC imparted? When Bill LaSalle, my predecessor, first announced his retirement, we immediately set up regular meetings where we’d talk for hours on end. He transferred everything he could think of to me, and then we had regular one-on-one calls, so I could ask him questions that arose as I learned and, eventually, as I began work as the GC. Bill had spent his entire career in-house, and up until joining Ricoh in 2013, I had spent my entire career as outside counsel. Bill was a huge help in initially transitioning my perspective from advocate litigation counsel (a perspective developed over 25 years as outside counsel) to in-house counsel. As a lawyer, you have to consider all possible outcomes, especially the worst—I call it “the Parade of Horribles.” When you’re outside counsel, risk is the enemy. You want to push your client to protect themselves and avoid risky behavior. But as a business, you can’t avoid all risk, or else your business fails. Bill helped me understand how to [reach] decisions that protect the company but don’t shackle it. For women and minorities looking to assume a general counsel role at large Fortune 500 or multinational companies like Ricoh, what advice would you offer on ways to stand out? I can only speak to my own experience. You have to identify and emphasize your strengths, and develop good relationships with everyone you can. Prior to becoming GC, I scheduled quarterly meetings with business leaders not only to share relevant information but also to listen to their objectives, strategies, and challenges, and to figure out how I could assist them in reaching those goals. I feel like a GC should be a business partner, a safety net, and a crossing guard. And, finally, when voicing a concern, work to identify yourself as a problem solver with a solution or alternative approach to keep things moving forward. What role do you and your legal department play in efforts to help Ricoh Americas enter new markets? I think the legal department always has to be a partner with marketing, sales, corporate planning—every department, really—to think about what’s in the big picture, and what questions should be asked. Unfortunately, many organizations wait to bring in legal until after strategizing, after setting a course of action, or even after execution has already started. Then you have legal bringing everything to a halt: “Wait, there’s a problem here!” Had legal been involved in strategy and planning sessions [at the outset], they [could have] identified potential areas of concern early on. Ricoh does a good job of avoiding that particular pitfall, and I’ve been trying to work on further integrating us with other departments’ decision-making processes. Legal doesn’t have to be leading the discussion or driving the strategy, but just being a voice, or even an ear, at the table to know what’s coming can go a long way. How are you helping Ricoh navigate legal, ethics, compliance, security, and regulatory affairs across the Americas, and how have you structured your team to address them? While Ricoh has had a compliance officer for years, we are creating a [new] committee, with the intent of bringing compliance heads together from departments across the organization to discuss the issues we face and work in alignment to address them. Breaking down silos of information is a major focus for Ricoh as a company, so this was a major step for simplifying and streamlining, as well as making sure we’re “eating our own cooking,” so to speak. Beyond the compliance committee, we’re doing monthly ethics blogs, videos, surveys, and planning events around [our] national “Corporate Compliance and Ethics Week.” [This is] part of our new CEO, Joji Tokunaga’s initiative to better showcase Ricoh’s commitment to ethics. I think it’s very important for the company, and especially the legal department, to talk everyday ethics—small ethical quandaries that arise every day, which we all face. I want to encourage people to ask how we make ethical decisions, and where they can go for resources to make the right decisions. In a recent conference, Ricoh highlighted its business strategy to help dealers advance customer experience goals. How do you and your legal team help the company execute on these types of strategies? As I mentioned earlier, getting legal involved early and often in decision-making can work wonders. The Ricoh Family Group (RFG) dealers are an integral part of our business and our go-to-market strategy. Because of this, two members of my team are specifically assigned to support the dealer organization, from both strategic and transactional perspectives, with the intent of anticipating potential issues, developing plans to avoid or address them, and to make sure the dealers’ business is as smooth and simplified as possible. As you settle into your second year as general counsel, what are you most excited about tackling next? Good question. In this coming year, I’d like to work on [additional] ways to help Ricoh, its partners, and customers, even if it’s not something that GCs have traditionally done. I intend to push for more standardization, automation, and simplification on the transactional sales side. I think streamlining those processes can free up a lot of resources, as well as open the door for more people across my teams and department to actively pursue their professional development goals. This profile originally appeared in In-House In Brief, a biweekly newsletter of Big Law Business and the In-House Council. To receive up-to-the-minute news and analysis curated specifically for in-house counsel, subscribe for free today. Learn more about the In-House Councilevent series.